With the gorgeous weather yesterday, I knew there’d be moths flying come evening. I put my mercury vapour light out, even going to the trouble to dig out and pin up my white sheet in front of it. And I wasn’t disappointed! I got a great diversity, 15 macromoths of 11 species, and another dozen or so micros of the agonopterix and acleris variety. 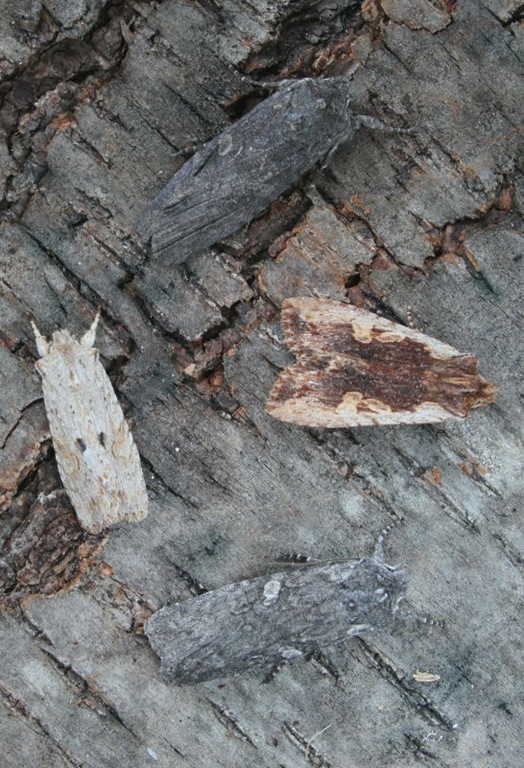 I collected up one individual of every species except the Straight-toothed Sallow, which was the First Moth of 2012. The top shelf of the fridge was satisfyingly crowded. Since I’ve already got dozens of photos of these species on the plain background I usually use for species portraits, I thought I’d do a collage, in groups. The above group is all the sallows (again, minus the Straight-toothed, which I sort of wish I’d brought in just for completeness). 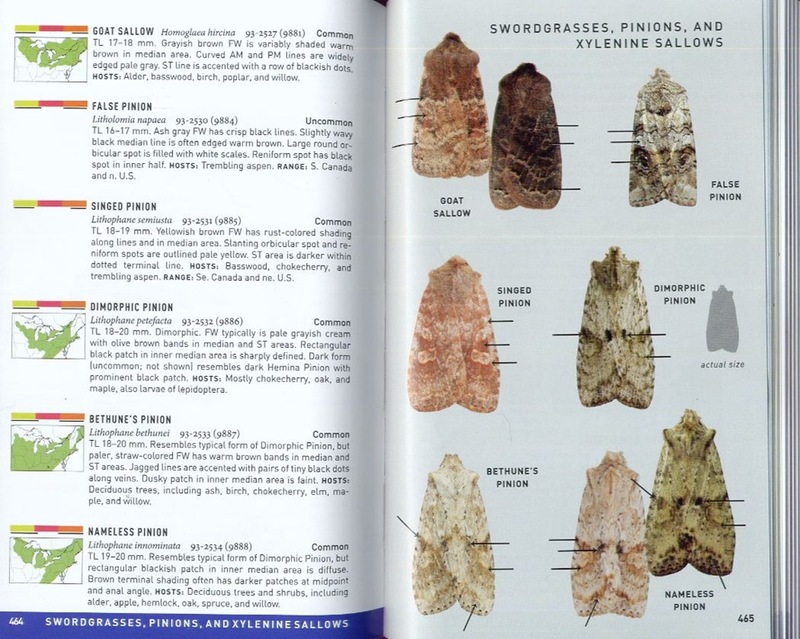 Top left: Goat Sallow, Homoglaea hircina; top right: Morrison’s Sallow, Eupsilia morrisoni; bottom: Three-spotted Sallow, Eupsilia tristigmata. There are three early-spring geometers that you can pretty much count on on any given night in March and early April. I was pleased that all of them turned up last night – just singles of each. 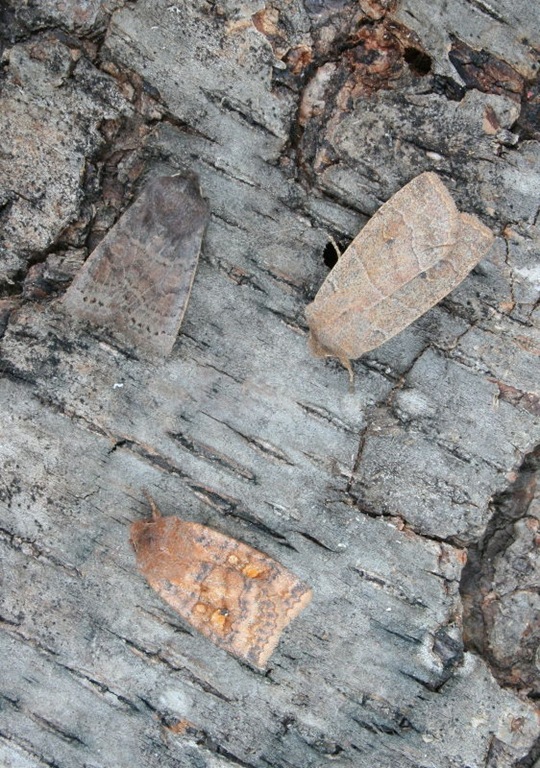 Top to bottom: Small Phigalia, Phigalia strigataria; The Half-Wing, Phigalia titea; and Spring Cankerworm, Paleacrita vernata. Having this photo with them all in the same shot helps emphasize the size difference between Small Phigalia and The Half-Wing. And finally, the pinions. The third group of overwinterers who’re likely to come to lights early in the season. I was surprised there were so many species last night, ordinarily I just get the bottom one here. 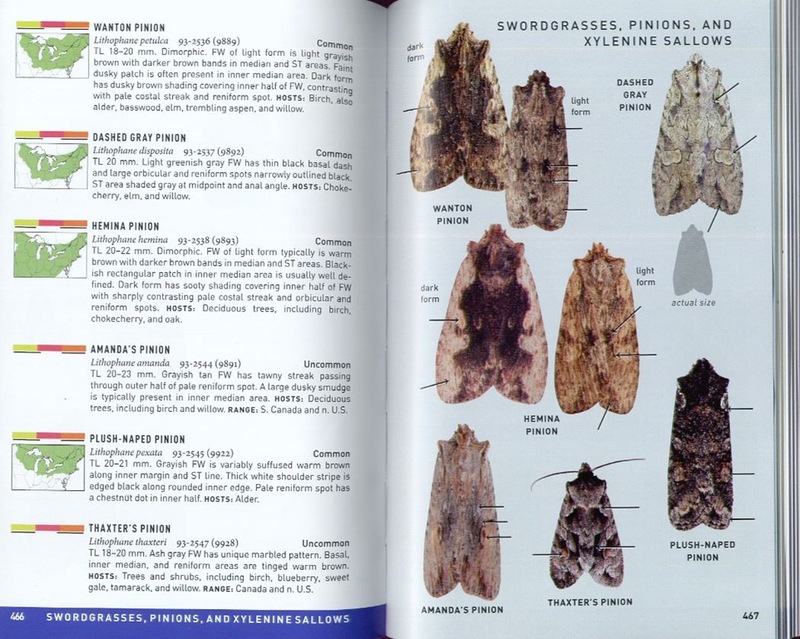 Top: Dowdy Pinion, Lithophane unimoda; middle left: Dimorphic Pinion, Lithophane patefacta; middle right: Hemina Pinion, Lithophane hemina; bottom: Triple-spotted Pinion, Lithophane laticinerea. These guys have distinctive shapes and so are easy to pick out, usually. 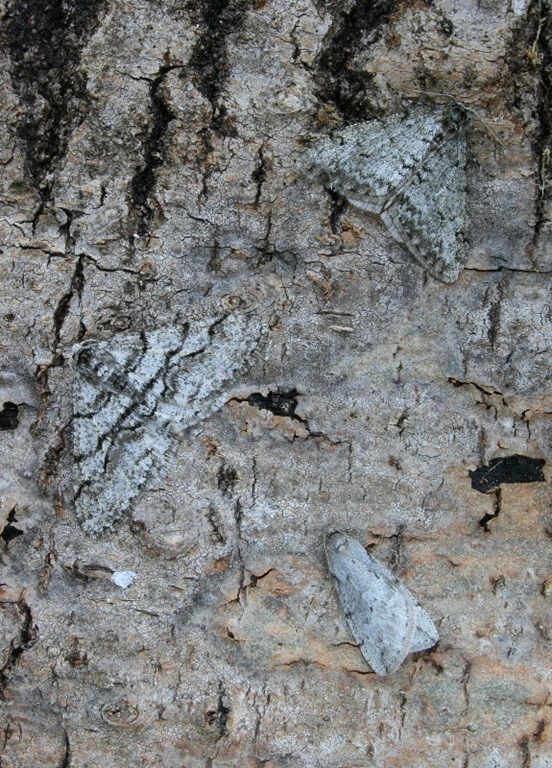 There are two shape types: the long, narrow gray ones, and the bow-winged (look at the outer edge), shoulder-padded ones. Within each of the shape groups there are a number of look-alike species. For instance, Hemina and Wanton Pinions look very similar, but Heminas tend to be orangier with more diffuse markings than the grayer Wantons. Likewise, Grote’s and Triple-spotted can be hard to tell apart, but Triple-spotted typically are a smoother gray with the ST line often sparser/dotted or nearly absent compared to the rougher-gray Grote’s. 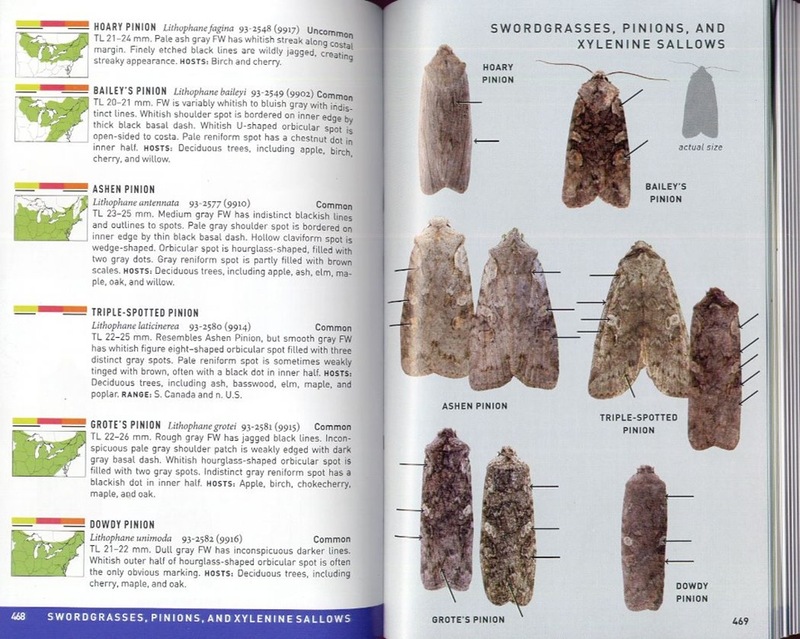 Since we’re still a month out from the release of the moth guide (but only a month! April 17!) but the pinions are flying now, I thought I’d scan in and post the identification plates for the group. Enjoy! For all of these, click on the image to see a larger version. Bless you for posting the Lithophane plates. They’re coming in handy! :) Nice photos of your mothy visitors, too. They are interesting, the moths. The moose tracking is a challenge. We have deer, no moose in Lanark County. We had a cougar sighting last month, too! Ugh…still over three weeks until the book is published. I might be dead by then!